This blog is based on my keynote presentation at the Fablearn conference in Eindhoven on September 28th 2018. Pendulums and coils are not covered in DEPS but earlier in the year in “classic and relativistic mechanics” and “electricity and magnetism”. That’s how learning works: students1 build on knowledge they gained earlier. The first group has expended their knowledge on electrical fields in and around coils. The second group has expended their knowledge on interaction of pendulums. Sounds good but it is actually a problem: they learned different things. When giving a free assignment, I’m sure that my students will learn something valuable. I just don’t know a priori what they will be learning. This is mainly a problem for my boss2: the principal of the applied physics track. He is responsible for the entire curriculum, not just a single course. To be allowed to give maker education within our curriculum, I not only have to convince my boss of its merits for our students, but also provide him with arguments to give to his boss, our dean, when asked why he’s spending money on this new method of teaching with uncertain learning outcomes. The year before I was allowed to start teaching DEPS I spend on convincing all stakeholders in our department. In the rest of this blog I will explain the three arguments we used to make the case that maker education is a good fit in a well balanced curriculum. It seems weird to go against the “discover by yourself” mentality of maker education, but in reality no assignment is completely free. As teacher you can play with the amount of freedom you give to your students. The final assignment of DEPS is very free: any physics demo is ok. To balance that we give our students six workshops before the final assignment that are much stricter. In one of these they have to make their own sensor based on a plate capacitor. Limiting the options in this way means that I am sure the students will have to understand and apply the equation for plate capacitors, one of the learning goals for that assignment. Students are still free to design their own water level sensor, mass sensor or anything they can link to the capacity of a plate capacitor. A plate capacitor made by my students. The difference between a maker education assignment and a practical is that in a practical there is only one good answer, one way to correctly do the assignment. A maker education assignment can be executed perfectly by tow different students with totally different designs that both fit the requirements of the assignment. This essential difference means that students will identify much stronger with the results of a maker education assignment: it is their project. By narrowing the scope of a maker education assignment you can predict what topics the students will encounter and learn. These topics can be build on further in the curriculum. Because my students have worked with plate capacitors, the teacher of “electromagnetism3” later in the year can build on that. If a strong focus on continuity in topics is required in the curriculum, you can use “less free than it appears” to explain why maker education fits in a well balanced curriculum. Maker Education is often praised because students learn “21st century skills” while making things. Programming, 3D design, “thinking like a designer”, but also negotiation and collaboration skills are acquired as part of working as a team on a physical project. If you want to focus on these skills as learning goals, you have to design your classes in such a way that your students have to encounter them. This can be achieved by telling the students how to work, but not what to build. If you want students to design before building, have them hand in their design before they are given materials to build. In this way students retain the freedom to make a project of their own, but you have dictated the process they have to go through. Of the ‘product’, ‘process’ or ‘total freedom’ approaches to an assignment, the ‘process’ approach causes most development in the learner. In primary education this can for example mean giving an assignment where pupils have to use a specific tool from the “50 essential tools”-poster by Astrid Poot. In secundaire education a teacher can make students go through the ‘idea – design – make – evaluate – improve’ steps from the design cycle. In my course I have my students construct a morphological chart detailing different solutions to sub-problems in their assignment, before they pick a combination of these solutions and start fabricating. In all these examples the teacher does not dictate what the students will make, but the teacher does outline the process that has to be followed, thus ensuring learn the skills (learning goals) that she/he intend them to learn. When the curriculum asks for “21st century skills”, you can “focus on skills” to explain why maker education fits in a well balanced curriculum. Even though I didn’t teach about pendulums or electric fields, the final assignment of DEPS was still an excellent opportunity to asses if the students had adequately learned about these topics in previous courses. It is impossible to design and build a functioning coil with out understanding electric fields. Making is a different way of using once knowledge than answering questions on an exam is. By observing the product that students make, and by observing the process of making, the teacher can asses whether the students truly mastered the knowledge from previous courses to the point where they can apply it. As Arjan van der Meij famously said: “Maker Education is condensed learning”. Maker Education is condensed learning. The process of making is a formative assessment of prior knowledge. When teaching a collection of lessons on a single topic a teacher can structure it for example as follows. Start with a few lectures that introduce the topic and convey the essential knowledge. Follow up with carefully designed exercises to allow the students to get familiar with the material. 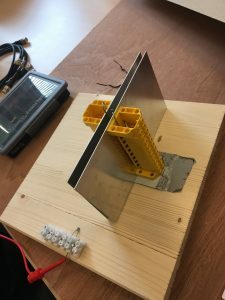 Finally, close of with a maker education assignment in which the student have to apply the knowledge gained on the topic and condense it into a physical object, showing they not only understand it, but can apply it. When the curriculum asks that students are able to apply knowledge, use “Maker Education as formative assessment“ to explain why maker education fits in a well balanced curriculum. Those are three arguments that as a teacher you can give to your boss to convince her/his boss about the added value of maker education. Maker education as formative assessment. Students in applied physics must understand that sometimes you can only fabricate once due to cost restrains. In these cases it is essential to make a design meticulously and without any errors. Students in applied physics must experience that often they design elements that are smaller than the human eye can observe, yet that do have measurable functions. A student tests the chip that she has designed herself. Make a chip that can function as an amplifier or an inverter. We will be fabricating the chip for real so make sure your design fits the fabrication criteria: you only have one by one millimeter of space on the chip. There are 4 contact points to the outside world. Etc. Within these tight demands the students were free to design their own chip that differs from what their neighbors might be designing. In this way it remains a project instead of a practical and that was apparent from the pride that the students showed when looking through a magnifier at the chips that they themselves had designed once they were fabricated. First design your circuitry in LTSpice. Have a TA check your circuit before moving on to drawing your circuit on your chip in KLayout. Check your design against the fabrication criteria. Finally, check the design of your neighbor as well. Why does the resistance of your design remain the same when you make your design twice as small? Having all our students design their own chips that actually got fabricated so each student could proudly hold (and measure!) their own piece of silica was the final straw that convinced our dean that maker education fits in the curriculum of Applied Physics. If you want to introduce maker education in your classes, but first have to convince your organization, than you can use the three arguments provided in this article to make clear why maker education with free assignments fits in a fixed curriculum. No Problem. PS What is Maker Education? Many definitions of what is, and what isn’t, maker education can be found online. 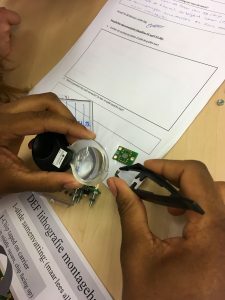 For the purpose of this blog I’m using this definition: Maker Education is a collection of teaching activities where students learn new knowledge and/or skills in the process of making a physical object that they also thought of / designed themselves. 1Although I teach college students, everything I argue in this blog is equally applicable to high school or primary school pupils. 2Prof. Chris Kleijn, director of education of Applied Physics at Delft University of Technology. 3In the Netherlands, we do not use the “101” system for naming classes. In any US university “electricity and magnetism” and “electromagnetism” would be called electromagnetism 101 and 102 respectively.